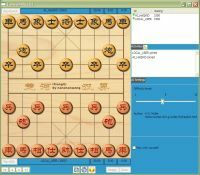 is top recommended free Chinese chess and a well designed open source program supporting multi platforms including Windows, Linux and Mac OS. It even has a mobile version for iPhone/iPod Touch available for free download from App Store. Support multi platforms and work with multiple online game sites, configurable user interface with optional board and chessmen designs, support multiple engines with adjustable difficulty levels, open and save games in xml format. No import from other game formats, no undo and redo moves although steps forward and backward are available for reviewing games. Computer vs computer mode not available.